Ashley Stark-Kenner has a definite eye for spotting uniquely chic room designs, as seen in this all-white bedroom with stately flair, this kitchen/dining area with modern French style, and her own elegant bedroom. Below, Ashley explains how the room pictured here creates its own particular variety of modern style. 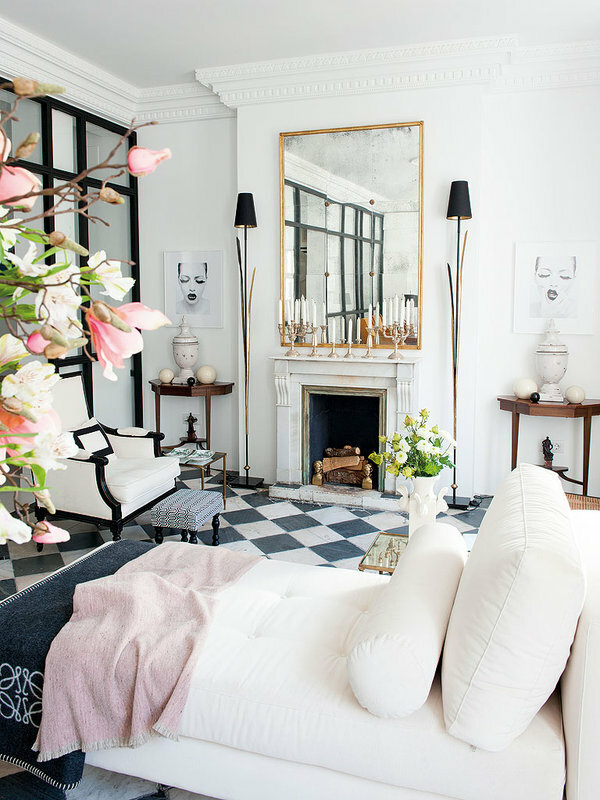 “The pink and gold accents, in addition to the flowers peeking into the frame, contribute just the right touch of softness to this room design. It’s not too girly, as evidenced by the sharp textures and minimal composition, which creates an overall atmosphere that is delicate without losing any contemporary sensibility. The checkerboard pattern painted onto the floor is another great example of an invigorating way to create a singularly stylish atmosphere.